Toothpick Sculptures for Kids 17 Toothpick Construction Ideas! Toothpick Sculptures for Kids :: 13 Fun Toothpick Construction Ideas! The kids and I made extra colorful toothpick sculptures yesterday, using spring-colored marshmallows, colored toothpicks, and translucent pony beads. I shared a couple of photos on Instagram, but wanted to follow up with a proper blog post, more pictures, and a round up of kids toothpick sculpture ideas. First of all, if you haven’t tried toothpick sculptures with your kids, definitely give it a try! 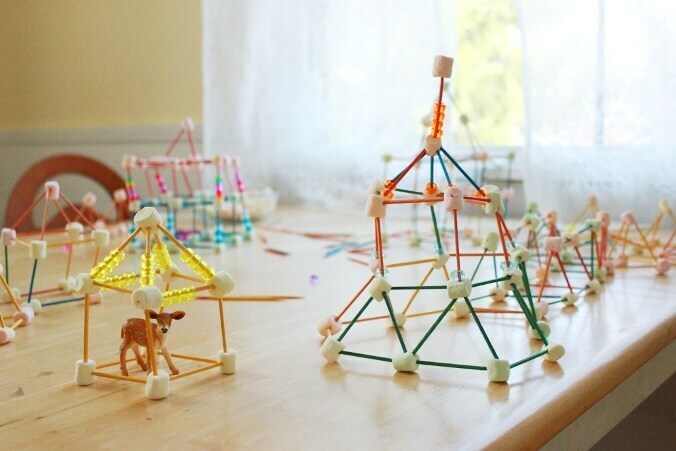 It’s a construction project that can be as simple as poking a bunch of toothpicks in playdough for young children or as challenging as building a geodesic dome or tower for older kids and adults. And with all the different great ways to build with toothpicks, everything from traditional marshmallows to Model Magic to sculpture as snack, you’re sure to find one to suit your family. We’ve made toothpick and marshmallow sculptures a fair number of times by now but this time I added some translucent pony beads (left over from umpteen melted bead projects) to the table. We threaded the beads onto toothpicks, in between marshmallows, for an extra pop of sparkly color. Maia’s an old pro at marshmallow sculptures, but Daphne (4.5yo) really got into it for the first time this round. The kids gathered their little animal figurines and dolls to populate the toothpick buildings and scenery. Doughs work too for making toothpick sculptures! We’ve used playdough, Sculpt-It air dry clay, and bread dough. And The Helpful Art Teacher used Model Magic with her kids, with great results. Have you tried toothpick sculptures with your kids yet? Any other ways to make them that you would add? Love these, especially the edible one’s, my kids would love to play with these while snacking at the same time, multi-tasking at its finest! Love these ideas… we tried the grapes the other day but I think I’ll try the cheese next. My daughter is allergic to food dye and I haven’t been able to find marshmallows (even white ones) without it, so that’s not an option. Thanks so much for all the work you put into your blog… it has brought a lot of joy to our home over the past few years! Wow! I am so excited to try this with the kids after school today! I feel like its great for a range of ages . Thank you so much! Amazing – it’s school holidays and I love this idea.